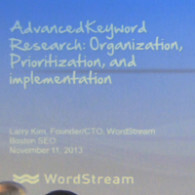 Larry Kim, founder of Wordstream, presented Advanced Keyword Research at the Cambridge SEO Meet-up, and was nice enough to let us film it. Here is a brief outline of what Larry presented. Larry started the presentation talking about just how important advanced keyword research is. He used his company blog as an example for what can be achieved if you are diligent, understand the concepts and implement consistently over time. He started the blog in January 2009 and it has a compounded growth over a 60 month time frame. So what does that mean? It means that the wordstream blog is now approaching 500,00 million visitors a month. Through the video Larry gives examples of how to do each step. To figure out how people are searching Larry talked about using a PPC Search Query Report and various keyword suggestion tools: New Google Ad Planner, Spyfu, WordStacker, Wordstream, etc. During this process you may develop 5000 to 10000 key words. He started with 5000 and over time it grew to 10000. Next you’ll need to break this big list into smaller niches. It’s hard to act on a large cumbersome list. To do this you’ll need to match similar keywords into groups or niches. What makes a great keyword niche is groups that are relevant to your business and are small and specific. Larry showed an example using xbox 360. Next is to apply these keyword niches to on page SEO. They should be specifically themed, one page per Keyword Niche, and organized with relevant information and content and information. Then just repeat. Wikipedia does a great job of this. After explaining all these steps, Larry did a real life example using the new Google Keyword Planner. I really liked his description of the planner and how it groups keyword suggestions for you rather than just giving the specific numbers on each keyword or combination like the old google keyword tool did. I really didn’t like this new tool much when it first came out. Larry’s explanation makes it much more tolerable. Sound in the back of the room was weak. I boosted & cleaned up the sound. It’s actually a little better than it was in the room.